Income inequality has been growing steadily among all Americans since the 1970s. 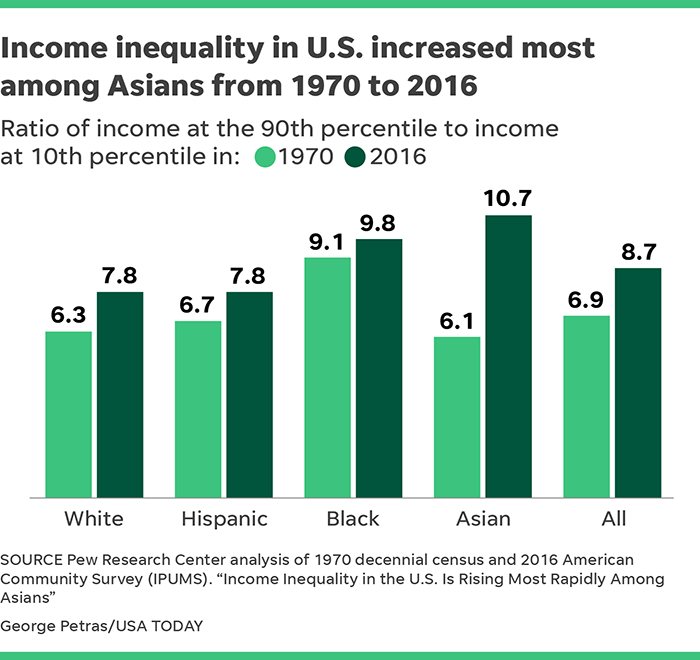 But within racial groups, the gap between rich and poor is growing most rapidly among Asians in the U.S., according to a new study. Asians continue to rank as the highest-earning racial and ethnic group in the U.S. on average, but the distribution of income among Asians has gone from being one of the most equal to being the most unequal among all major groups, according to new analysis by the Pew Research Center. From 1970 to 2016, the gap between higher-earning Asians and lower-earning Asians has nearly doubled and Asians have displaced blacks as the most economically divided racial group in America. The report found that the income gap between Americans near the top of income distribution (the 90th percentile, or those earning more than 90 percent of all Americans) and those closer to the bottom (the 10th percentile) grew 27 percent from 1970 to 2016. Those higher-earning Americans had 8.7 times as much income as lower-earning Americans in 2016. 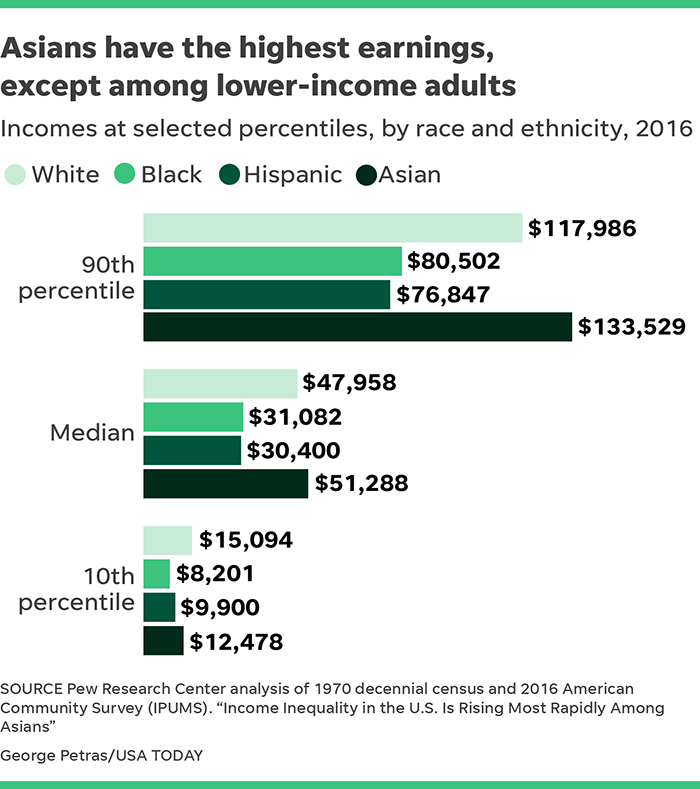 But just among Asians in the U.S., that income gap grew 77 percent in the same time period as higher-earning Asians had 10.7 times the income of lower-earning Asians in 2016. That is now higher than the income gap among blacks: Higher-earning blacks had 9.8 times the income of lower-earning blacks in 2016. The study used the 90/10 ratio as its measure of inequality, which it defines as “the ratio of the income needed to place among the top 10% of earners in the U.S. (the 90th percentile) to the income at the threshold of the bottom 10% of earners (the 10th percentile).” Income was defined as the sum of earnings from work, capital income (interest and dividends), rental income, retirement income and transfer income before taxes. The rising growth in income inequality among Asians is being driven by immigration and education levels, the report says. Asians are the fastest growing racial group in America and immigrants were responsible for about 80 percent of the that growth from 1970 to 2016, Kochhar said. There was a rise in Asian immigrants working in low-skill occupations from 1970 to 1990 as immigration policies favored family reunification and as the Vietnam war ended. That was followed by a rise in immigrants employed in high-skill occupations after 1990 as immigration policies shifted to favor skilled immigrants and a boom in the tech sector was spurred by the H-1B visa program. The result was a wide diversity in education levels and incomes among Asians living in the U.S. during that period. In addition to growing income gaps within races, income inequality between racial groups remains a significant problem. The study finds that the major racial and ethnic groups are divided into two income brackets: Asians and whites in the top half and blacks and Hispanics in the bottom half. “The gaps between the two brackets are sizable and the shifts since 1970, with few exceptions, have been modest,” according to Kochar and Anthony Cilluffo, the authors of the study. Furthermore, Asians and whites earn more than blacks and Hispanics at all levels of the income ladder. • Asians have the highest earnings at the top and middle income levels but not among lower-income adults. • The income gap between whites and blacks remain significant but narrowed slightly from 1970 to 2016. Income for blacks at the median and lower-income segment saw a bigger increase than comparable whites and kept pace in the higher-income bracket. • Hispanics fell further behind whites as the income gap between the two groups grew at all income levels. Income inequality in the U.S. remains an issue for all Americans as the earnings growth of the wealthiest continues to outpace everyone else. Lack of Racial Diversity in the AV Industry: Can We Talk About It?